All transactions are safe and secure with a reliable history in online purchasing behind each of our associates. 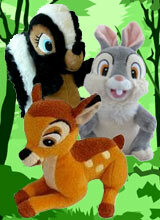 Buy the Bambi Plush Stuffed Animals to own Bambi clothing and merchandise. When it comes to having fun these forest friends know how to do it. Whether they are frolicking in the flowers or skidding along the ice, they can always find something to keep them occupied. These soft Bambi toys include a Thumper plush, a Flower the skunk stuffed animal and of course the leading man himself, who is sure to keep a kid happy year round. These cuddly buddies are a great addition to any child's collection. In addition to the Bambi Plush Stuffed Animals above, browse the Bambi Clothing Gallery for more apparel like men's and women's clothes, kids shirts or hoodies.